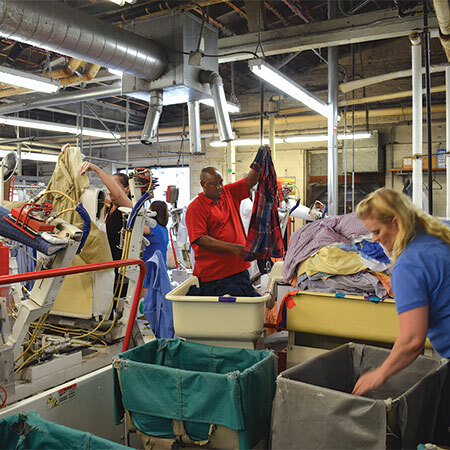 A Pratt Abbott drycleaning plant bustles with business. The company serves 60-70% of Maine’s drycleaning market from a dozen facilities and generates 38% of total company revenue, owners say. Pratt Abbott Uniform & Linen became a stand-alone business in 2000. 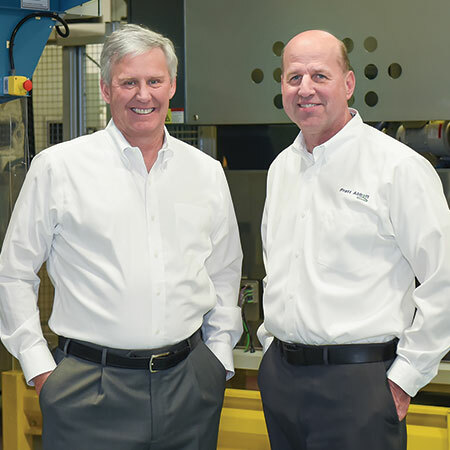 Operating from a new industrial laundry plant outfitted with the latest equipment, the company reports it has enjoyed double-digit growth over the last year. WESTBROOK, Maine — If you live in Maine, you’re likely a customer of Pratt Abbott Garment Care, the state’s largest provider of drycleaning, vended laundry and linen/uniform rental services. David Machesney and his father, Jim, purchased the company in 1991. It’s grown fivefold since, capturing market share through acquisitions, new development and continual improvement. Pratt Abbott umbrellas 12 drycleaning facilities, eight vended laundries and a 50,000-square-foot linen and uniform rental plant. By design, multiple revenue streams feed the enterprise. “One of the reasons we have all three business sectors is to provide volume to afford a management infrastructure which allows our employees growth opportunities,” says David Machesney. The other, he maintains, is because providing “everything clean” simplifies life for customers. Pratt Abbott was founded as a solitary drycleaning store in 1944, in Portland, Maine, according to Machesney. Among those hires was WWII veteran Roderick Lowell, who worked his way from the shirt presses to ownership in 1958. Lowell and his daughters staffed the counters, while Lowell’s father repaired and maintained machinery, according to Machesney. During the 1960s, Lowell opened additional drycleaning locations and expanded into uniform rental. Since acquiring Pratt Abbott in 1991, the Machesney family — children and grandchildren — have worked the counters as well. After Jim passed away in 2015, David took the lead. He’s since significantly grown each of Pratt Abbott’s business segments — dry cleaning, vended laundry and linen/uniform rental — benefiting employees and customers alike. Today, Pratt Abbott’s drycleaning business makes up 60-70% of Maine’s retail drycleaning market and generates 38% of total company revenue. Twelve drycleaning facilities bring multiple services to customers, including dry cleaning, shirt laundry and household laundry services. Other perks include free pickup and delivery, as well as off-season garment storage. Efficient equipment and processes ensure high-quality, eco-friendly results. Pratt Abbott’s vended laundry sector significantly contributes to the success of the company as a whole, contributing more profit than dry cleaning, according to Machesney. In many ways, the two intertwine. This is partly because most Pratt Abbott vended laundries and drycleaning stores are located side-by-side. This configuration draws revenue from a broader demographic, creates shared operational savings, and encourages consumer crossover. Uniform and linen rental — the most profitable Pratt Abbott business sector — began in the 1970s, but only recently ballooned in performance. Today, operating from a new, state-of-the-art commercial laundry plant, Pratt Abbott Uniform & Linen serves healthcare and hospitality clients within a 250-mile area. Making up a robust 58% of total company revenue, the business provides pickup and delivery of cleaned and leased garments and linens. During the last 12 months, it has realized double-digit growth, according to Machesney. Thanks to the new plant’s size and equipment mix, he expects that growth rate to continue for the next two to five years.